The UVic clarinet studio had their instruments tuned-up by master repair person Wojtek Komsta this week. Mr. Komsta came all the way to NYC to help out the UVic clarinets studio and we were thrilled to have him! The UVic Clarinet Class enjoying a lovely dinner together! 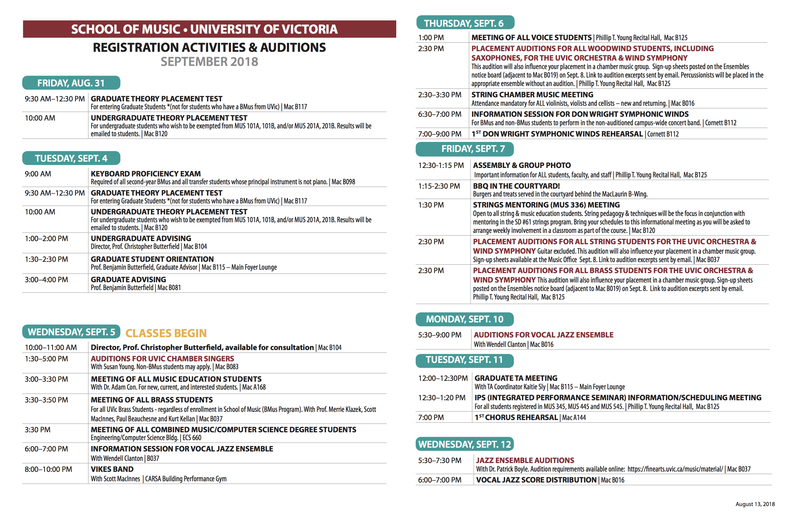 Click here to view the 2018-19 UVic Music Season Brochure which lists the concerts taking place in the UVic School of Music. Students receive complimentary tickets to most concerts with their ONECard if booked in advance. Ticket information can be found here. Also some concerts are live-streamed online. Click here to find out which concerts will be available for livestream. Here is the first in a series of interesting articles by percussion and piano duo, Passepartout, about their lives traveling and attending artist residencies without a home base. Chris and Nico are not only brilliant musicians, but also eloquent writers as well. This first article in their series can provide insight on their unique musical lifestyle. Click here to read their article. Also watch Passepartout Duo perform. With a new term beginning I thought it would be a good idea to provide a few pointers for success during the term. Write practise times directly into your class schedule. This way you know exactly when you practise each day. Warm-up prior to you lessons and rehearsals. This will save time and allow for more time to focus on technique and repertoire. Always practise with a mirror, tuner, and metronome. Keep your reeds in rotation so you always have a good reed to play on. A bad reed can derail a lesson or practise session. See this article by Reiner Wehle on how to break in reeds. My motto: Life is too short to play on bad reeds!!!!! Your warm-up is the most important part of your practise. A good warm-up should include long tones, scale technique, and articulation. Organize your practise time. Practising should include a warm-up, etudes/studies, repertoire. Your practise time will vary depending on how much repertoire you are working on. Set small achievable goals for your practise sessions. Measure your practise time by tasks rather than time. Putting in multiples hours is useless if you don’t accomplish anything. Listen to other clarinetists and see as many live concerts as possible of varying genres, styles, and ensembles. Students should have a music folder for their lessons, a notebook, and pencil. Each students should download and print the Clarinet Warm Up Materials and bring them to each lesson. Here is a great article about adjusting and selecting reeds by Robert DiLutis.